The magical opulence of our bespoke and detailed console tables capture the high levels of craftsmanship and tradition of Indian design. Iris furnishings currently offer a selection of daringly beautiful console tables available in an array of muted tones inlaid with polished bone. Our hand-crafted console tables are an example of flawless design, fusing traditional methods of Indian craftsmanship with contemporary nods to the modern home with a distinct yearning for style and luxury. Each and every console table we make is made in ethically-sourced and quality materials. 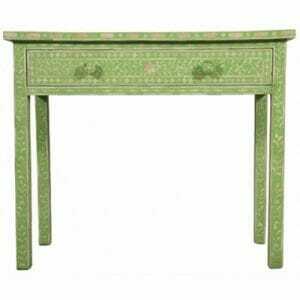 Where Can I Find Artisan Console Tables in the UK? At Iris Furnishing we offer a wide choice of Indian inlay, white metal and painted furniture in various effects from ornate patterning to distressed wood effect. We deliver in the UK and Internationally and are based in Sussex with a Brighton showroom, where you can arrange viewings by appointment. We have a huge range of console tables in a variety of colours and finishes in our collection and more can be made to order on demand. These artisan made console tables come in every colour from soft grey to raspberry pink with neutral whites and the natural tones of inlaid mother of pearl and ethically harvested camel bone providing an endless array of aesthetic effects to choose from. 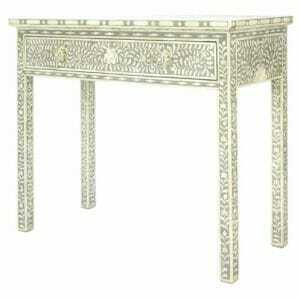 White metal console tables with their rich, ornate emboss work provide a stunningly decorative alternative to inlay, while a smooth white metal finish can be ordered for those who prefer a minimalistic style. We have decades of experience in our field and are proud to sell ethically made, sustainably resourced and fairly traded furniture made to uncompromisingly high standards whilst retaining its affordability. We work hard to maintain these standards and are not long out of the workshops in Rajasthan before returning to be part of new developments, happy to be closely involved with every part of the creative manufacturing process. 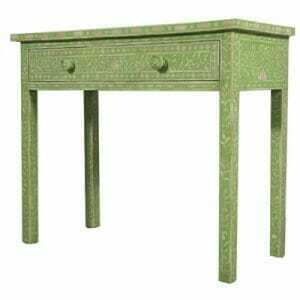 Who Makes Decorative Artisan Console Tables? 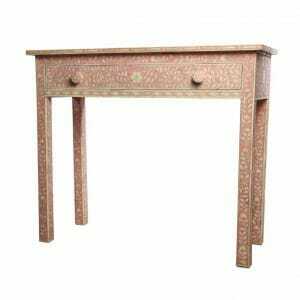 Master craftsmen in Rajasthan set to creating new, inventive decorative designs alongside the more traditionally patterned console tables we sell at Iris Furnishing. The skilled workers who are trained into becoming expert artisans and masters in their field are ever integrating ancient craft and carpentry techniques in a fusion of traditional and innovative design styles. True creators, they treat each piece as unique, as it necessarily is with its natural materials and their inherent variations. Every piece of Indian furniture created in the Rajasthani workshops is an authentic example of decorative Indian art, where meticulous care and attention to detail is applied time and again, with fastidious skill to the furniture designs that incorporate the timelessness of their art with contemporary reinvention. The console tables are made here from Indian hardwood, sustainably resourced and fashioned into the solid structure that supports the ornamentation throughout the years to follow, with its refusal to warp and ability to keep its integrity under duress. Can I Order a Bespoke Console Table? At Iris we offer a vast array of decorative, artisan furniture and console tables can be ordered in any of the decorative finishes you see anywhere on our website. With such an expanse of choice in a huge range, we feel there is something to suit everyone within our collection. However, we also feel every piece of furniture should perfectly fit the home its made for and reflect the choices of the individual, so you are welcome to order your luxury console table as a bespoke item, hand made to measure in the dimensions, colour and finish of your choice. If you let us know the measurements you require and the decorative finish you prefer, we can answer you with a quote and let you know when to expect your completed furniture to arrive. We can also help you with any details you want to finalise. 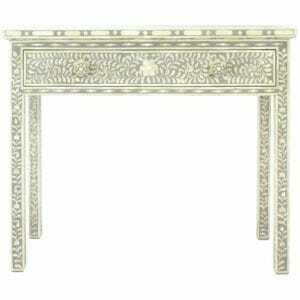 What Makes a Console Table Beautiful As Well As Practical? With a solid wood framework for structural strength and neat woodworking joints, designed to take the weight of whatever you want to store in it or on it, our artisan console tables demonstrate exquisite form and function. Likewise, with its decorative ornamentation beautifully set in coloured resin or embossed metalwork, with the meticulous expertise characteristic of our artisan makers, our console tables are an object of unmissable beauty in an entrance hall, hallway or living room, tending to become a conversation focal point wherever they’re placed. The natural variations in tone and light form a beautiful aesthetic, which constantly pleases the eye and surprises expectations with a subtly changing visual appearance all the time. This applies to our inlay and our white metal console tables alike. Embossed or smooth, white metal responds to the changing lighting in a room in a constant play of warm reflections, amplifying a cosy atmosphere and giving lustre and depth to a space even in cool daylight. Mother of pearl inlay refracts the light into subtle rays of iridescent colour which appear momentarily as you move. Its background hue of natural off-whites can contrast subtly with a white or light grey background, or dynamically with a dark blue or charcoal console table. What Colour Console Table For Grey Walls? With the intricate patterning of mother of pearl or camel bone inlay, you can introduce a rich, dark or deep colour into your décor scheme and have it lightened and broken up by the floral inlay patterns that temper strong colours. Grey walls are the perfect choice for offsetting a piece of furniture with some colour to it, giving a neutral background that shows the colour off to its full effect. Our console tables can justifiably be considered works of Indian art and when introducing a coloured item of furniture into your home, a grey wall will make a feature of it, helping it stand out without visual distraction. The versatility of grey walls as a background means that even a light grey or charcoal grey console table will look good against them, without needing to match in tone or hue. Grey against grey generally works very well, giving the soothing effect of monochrome variations in a low contrast aesthetic. This accentuates the patterning and ornate detailing on the nacre inlay and leaves colour out of the visual equation. A white console table against a grey background will create a visually striking contrast where the interplay of hue on the console itself will be quite toned down. 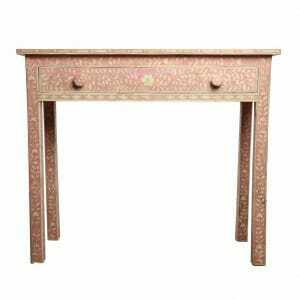 One of our favourite colour combinations is a raspberry pink mother of pearl inlay console table against grey walls and the console table can be ordered in this colour if you agree with us that this is indeed a beautiful combination.